Nobody does "power" fishing better than KVD. The Quantum Kevin VanDam Tour Baitcast Reels are designed to fit his aggressive style, with upsized line capacities, self-tightening carbon fiber handles, and gear ratios for everything from deep cranking to burning the grass. Advanced features: one-piece aluminum frame and sidecover with titanium deposition finish; MaxCast skeletal spool; Super Free Spool system; Ti-coated line guide; polymer-stainless hybrid PT bearings; ACS3 self-adjusting centrifugal cast control via quick-release sidecover; advanced ceramic drag. 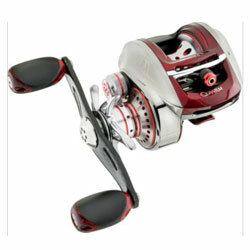 "absolutely one of the best reels i have ever purchased. paired it with the kvd 7'4" crankin rod and can reach out and touch em in the toughest places. " "This is the second tour series reel that I have purchased. The first was the burner and this time around I opted for the 6:3:1. I put 50lb excel braid on it for fishing heavy cover and it cast as smooth as the flourocarbon I have on other reels." "This is my new favorite reel. I have used it on Guntersville and several small lakes around where I live and it has performed superbly. Once you get the brake and cast control set it will cast farther than anything I have ever owned. "